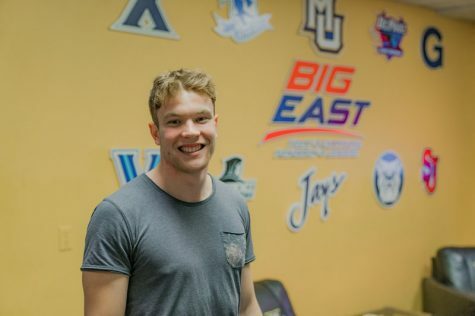 While lacrosse, tennis, track and field and golf hit the heart of their spring seasons, Marquette’s fall sports – men’s and women’s soccer and women’s volleyball – succeeded in exhibitions as they prepare to defend their 2013 Big East titles. The men’s soccer team kicked off the spring season by playing opponents of varying skill levels. 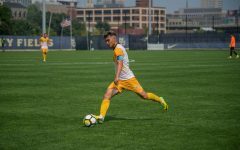 In their opening game, the Golden Eagles faced off against Indy Eleven, Indianapolis’ North American Soccer League team. 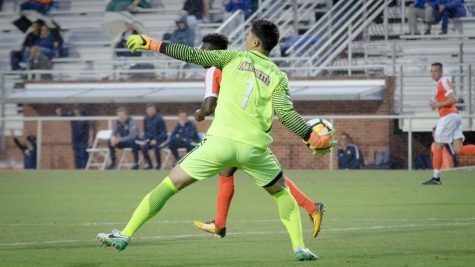 The professionals overwhelmed the student-athletes, who dropped the game 3-0. 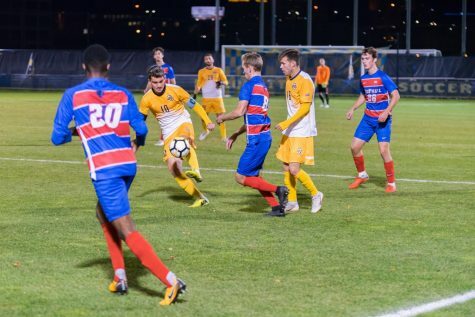 The Golden Eagles then returned to Milwaukee to play a double-header against Cardinal Stritch, a National Association of Intercollegiate Athletics team, and Wisconsin-Milwaukee. 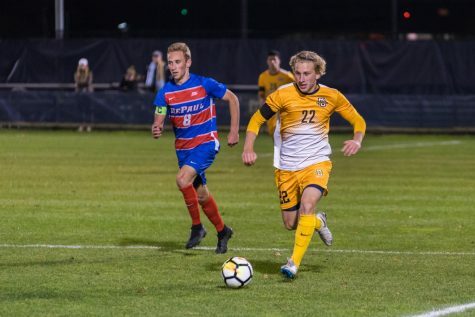 The two games allowed for most players to get valuable playing time, including redshirt junior John Mau and freshman Coco Navarro, who played all 180 minutes. 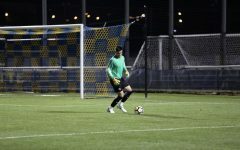 After a few days rest, Marquette traveled down to Chicago to take on the Chicago Fire’s Reserves. 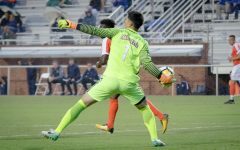 The two teams played a physical first match, but it was the Fire who struck first, scoring in the 40th minute. The Golden Eagles took the one-goal deficit into the half, but the Fire extended it in the 56th minute to take a 2-0 lead. 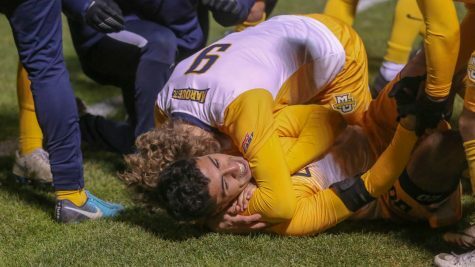 Two more goals in the 78th and 83rd minute saw Marquette fall 4-0. The team’s spring schedule continues against Creighton in Omaha, Neb., April 12 for the annual Kicks for a Cure event. 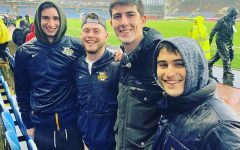 After a 1-0 victory against Notre Dame, Marquette women’s soccer continued its spring campaign by playing a double-header against Iowa and Wisconsin-Milwaukee March 30. 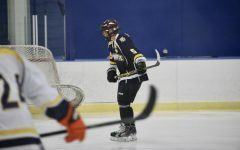 In the first match against Iowa, neither team was broke through, and when the final buzzer sounded, the teams were 0-0. 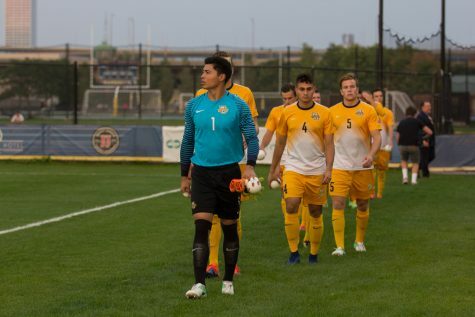 After a quick turnaround, the team played a second game against its crosstown rival, UWM. The game started out much like the match against the Hawkeyes, but the Panthers beat junior goaltender Sofie Schunk in the 15th minute to go up 1-0. 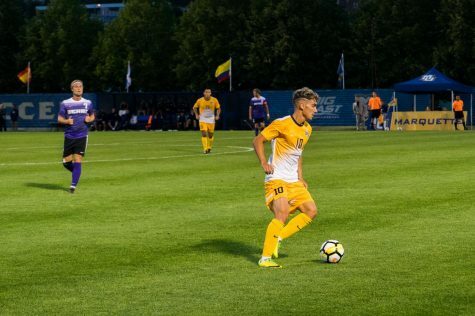 Marquette immediately pushed back and put pressure on UWM, and freshman Ashley Handwork tied it at one in the 28th minute. Marquette took its energy from the late-half goal and kept it going, as Handwork notched her second of the game at the 32nd minute mark. The Panthers tried to answer, but Marquette added to its lead when freshman Andee Nelson found freshman Anna Jurken inside the box to make the score 3-1. Jurken’s first collegiate goal was enough to get Marquette the victory. 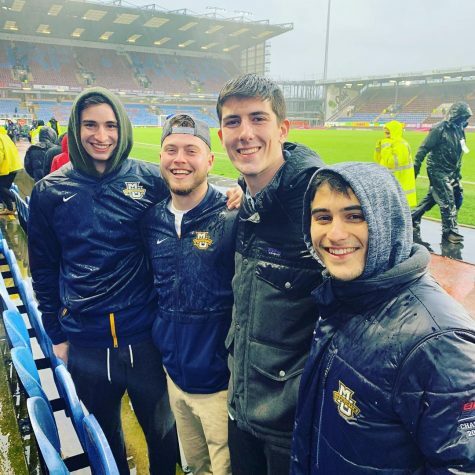 April 6 saw three games in one day for the Golden Eagles, as they traveled to Illinois to play Illinois, Northwestern and Kentucky. In the first match against Illinois, sophomore Ann Marie Lynch went down in the box and junior Mary Luba slid a penalty kick past the goalkeeper to give the Golden Eagles a 1-0 lead. The penalty kick was enough, as neither team was able to find the back of the net for the rest of the game. The games against Northwestern and Kentucky had 40-minute halves instead of the typical 45. Marquette came out guns blazing against Northwestern. Just five minutes into the match, junior Isabela Carrasco found freshman Liz Bartels in the box to get the 1-0 lead. Eight minutes later, Carrasco added to her assist with a goal, as she one-timed a pass from Luba. In the final match of the day, the Golden Eagles battled Kentucky. The two sides battled for the first goal, but all shots either missed the net or were saved. 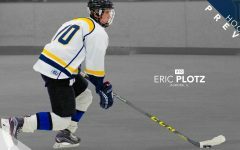 With time winding down, both squads were desperate for a goal, but came up empty-handed, as the game ended scoreless. Through six spring games, women’s soccer is still unbeaten. The squad will put that record to the test when it travels to Madison to take on Wisconsin April 16. 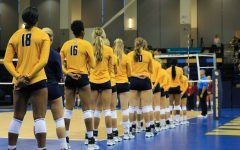 Ryan Theis made his Marquette volleyball coaching debut when his squad competed in the Mizuno Great Lakes Center Spring Collegiate Tournament. 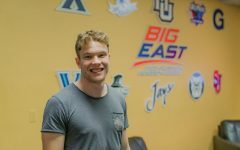 In his first match, Theis faced off against his alma mater Wisconsin-Milwaukee, and the Golden Eagles came out and swept the Panthers 25-13, 25-17, 25-16. 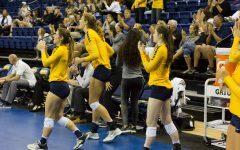 Marquette kept up the momentum against Southern Illinois, sweeping the Salukis 25-16, 28-26, 15-9. 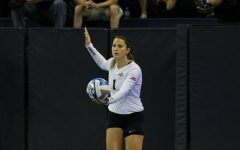 In the tournament finale, however, Michigan State handed Marquette its only loss of the tournament, 25-18, 25-15, 25-23. 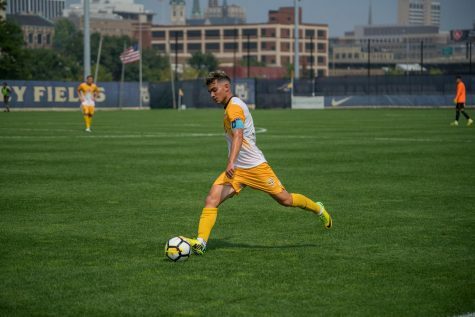 Marquette then hosted its own tournament April 5, facing Loyola-Chicago, Northern Iowa and UWM once again. The squad started off the tournament with four straight set wins, defeating Loyola-Chicago 25-19, 25-19 and Northern Iowa 25-20, 25-19. In the rematch against UWM, the Golden Eagles dropped the first set 22-25, but rebounded in the second set, winning 25-19. Marquette completes its spring season in Madison, where the squad will take on Wisconsin.